Geoffrey Robertson’s was another impressive speech today. He reminded us of the days of the “dock brief” and of what Stephen Sedley has called the “great sleep” of public law in the middle of the 20th century – just before legal aid was created, he reminded us. He ended by attacking the government’s “hidden agenda”: to make it easier for itself to act unlawfully, without proper scrutiny or redress. 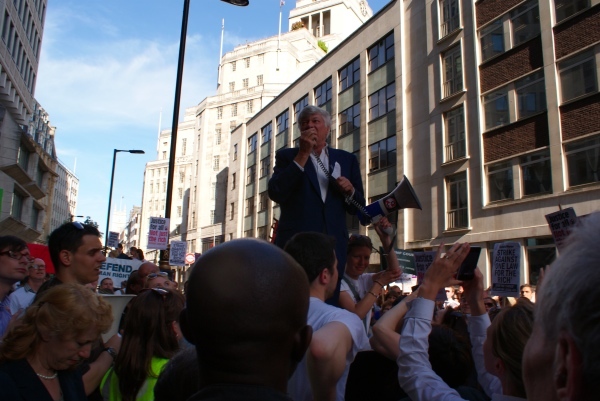 He was the one speaker I heard to make any counter-proposals for cuts: he suggested better off households might have to make substantial contributions to criminal legal aid, rather than being denied it altogether; and he suggested cutting more from silks’ fees rather than doing as the government plans. He mentioned Trident, too – which he said was worth 45 years of legal aid. I fear that the ‘hidden agenda’ may go even deeper that Mr Robertson suggests. The economic problems are being used, by autocratic governments, as an excuse to reduce the right of the people. Dev Hurnam, British Qualified Barrister[Non-Practicing] following an unjust and outrageous conviction of hindering police in an enquiry/.